This easy chicken salad recipe is made with scallions, cilantro with a hint of lime. 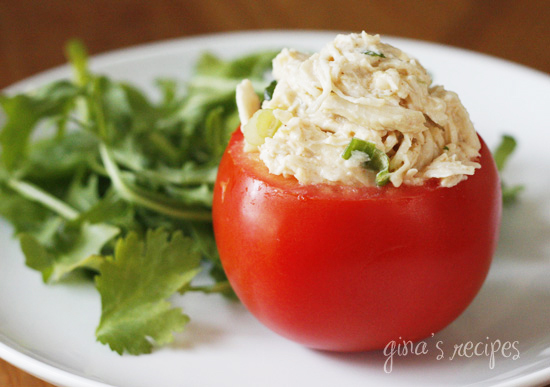 It’s a tasty twist on traditional chicken salad with some Latin flavor! I’m cutting back on my carbs this week, so I thought serving this in a hollowed out tomato would be a great way to eat this for lunch, but you could also serve this in an avocado half (yum! ), on a bed of greens, or enjoy this on toasted whole grain bread. I used leftover chicken breast for this, but you can also poach it or make shredded chicken in your crockpot. Combine chicken, mayonnaise, scallions, lime juice, and cilantro. Season to taste with salt, pepper, garlic powder, cumin, and chile powder. Add a little chicken broth if chicken seams too dry, 1 tbsp at a time. Cover chicken breast in broth in a small pot, add water if it doesn’t cover the chicken. Add salt and pepper, a piece of celery and it’s leaves (you could add herbs like parsley, garlic, onion, or whatever you want) and bring to a boil. Reduce to a simmer and cook 5 minutes. Remove from heat, cover tight and let it sit for 15-20 minutes or until thickest part of the breast registers 160 degrees. Chicken will be cooked through. Let it cool and cut into small cubes. This is such a perfect summer meal. It’s fresh, but has layers of flavor. So good. It’s also good with canned tuna. Tried this and it was fantastic. Served it over romaine. I added extra lime juice just because I had more in the lime I squeezed and was remembering the tip to add chicken broth if it was dry so why not. Delish and will definitely make again. I have made this several times, so good! Sometimes I add in homemade guacamole and use less mayo. Also, Trader Joe’s Chili Lime seasoning adds a nice taste. Love all your recipes. My husband and I have been cooking your recipes since May and have lost several pounds. Thank you! I’m so happy I found your site!.. I’m going to get my groceries tomorrow and start cooking your recipes, I’m on WW so you are helping me and inspiring to me! Gina, I just wanted to say thank you for sharing your passion for healthy food with us. I tell everyone about this site. This recipe is in my top 5 – made this cilantro lover very happy! Thank you! It looks gluten free to me, but isn’t labeled as such. Is it GF? So delicious! Adding to my low-point lunch rotation! Thanks Gina!!! I have a comment/ some confusion. This is the 3rd recipe I have entered into my app and created a food off of the nutritional information and my points calculations are different than yours. The app is telling me this is 3 points, not 1. I have a quick question – I see that this recipe counts as 1 freestyle point on Weight Watchers. However, when I put in the various nutritional information in the WW app so it can calculate the points based on this information it comes up as having being 4 points. Not sure why? Any help you could provide for the discrepncy would be very much appreciated! Thank you! This has my name written all over it! Thanks! What brand of light mayo does everyone like? I haven’t found one that doesn’t taste weird. Hi I made this for my lunch this weekend , it came out so well and also yummy . My friends had come home so tried this out and they loved it . Did find it a bit difficult while removing the pulp from the tomato but once I got that done , the rest was easy as I followed the recipe . I usually order online from this Asian Online restaurant called 48 East . They too had the same dish , so once I ate it from there , I thought of cooking on my own on a weekend as I am busy during weekdays with work . So I would like to thank you for this wonderful yet delicious recipe . Please do upload more yummy recipes as I have a passion for cooking and would love to try out new things on the weekends . any swaps for the mayo? And what the recalculation would be for Smart Points? I swapped for plain Greek yogurt – worked great. I just upped all the seasonings quite a bit. Not sure abou the points. This was one of the best chicken salads I have ever had. I normally don't comment on recipes, but I am going to start. I thank you for your website. I'm a college student and sometimes it's time consuming surfing the internet for recipes, looking up reviews, etc. I know if I go to skinnytaste that I will be satisfied with whatever meal I decide to cook. I have NEVER been disappointed, and I am very picky when it comes to how my food turns out. Thank you again! This recipe was very good! At first my husband wasn't sure what to think when I told him I was making chicken salad for dinner. I poached the chicken as recommended above. I didn't have cumin and I added celery and grape tomatoes cut into fours. 🙂 My hubby loved it!! I will be making this again. Thank you! Do you know the measurement in cups per serving? This recipe is amazing! I will be getting some more chicken tonight to make it again! Great job Gina! This made such a good lunch with some diced tomatoes and a bed of lettuce! I made this today and put it in a croissant with some avocado, romaine lettuce, and red onion. SO YUMMY!!! My husband and I LOVED it! @Anonymous 8/25/12, there is a delicious mayo alternative on the market that is dairy and egg-free, it's called Veganaise and it's amazing! I like it so much better than mayonnaise. You can find it at Kroger/Ralphs/Fred Meyer and Whole Foods. I just made this and its delicious! I bet you could do it with canned tuna, too. I don't really like canned tuna, but with these ingredients I would eat it! Thanks Gina! Hi Gina, im wondering how long this recipe keeps in the fridge? thank you! I love love love your recipes!! I just made this and it is soo yummy! I plan on taking it to the beach with me tomorrow for lunch. I added some tomatos from my aunts garden to this and it's so delicious. I have been making lots of recipes from your site and even my hubby likes everything so far. Just made this for my lunch tomorrow and it is fabulous! Thanks for all the great recipes. Makes eating healthy much more fun! Really, really, really good. Everyone from the 44 year old to the 8 year old loved it. Thank you! You are just amazing! I have yet to try something I did not like on here! Love this! I've made this over and over again. I do add a little more mayo, but no broth. LOVE it! Thanks for the great recipe! I just made this the other day. It's such an original taste. I did need an extra tablespoon of mayo to bind everything together, as well as 1 tbs of chicken broth. Very delicious. I've been eating it over a toasted english muffin. My husband doesn't like onions. 🙁 What can I use instead of the scallion? Thank you so much! I made this for lunch today. It was delicious!! I have yet to try one of your recipes and not like it. Thanks for contributing to my weigh loss and love of food! Made this for lunch today! It was delicious! Thank you for the great recipes! This is my new favorite recipe site! I just made this and it turned out great!! I used some leftover chicken I had from grilled strips with mexican flavor so it worked out perfect with the cilantro and lime, very tasty! Going in the boyfriend's lunch tomorrow and I have a plump tomato all ready for my lunch 🙂 Thanks for all the great recipes! Delish! Had on lavish bread and added sprouts and avocado, and replaced half the mayo with fage yogurt. So yummy!!! I added a little bit of finely chopped red onion and the zest of the lime. I ate mine on pita chips and it was awesome!!! This is by far the best chicken salad I have ever had! SO DELICIOUS! I completely agree with you!! I dont like chicken reheated. It just has weird taste. . .or maybe I have weird taste buds. Either way, this is a GREAT way to use up leftover chicken. I love that the recipe is for just 2 servings. So easy to half it or double it. My favorite way to eat it is on baked tostitos scoops. This chicken salad was delicious! Even my cilantro-hating husband loved it and ate my leftovers! Awesome recipe Gina!! I just made it tonight and I am so excited to make it again. 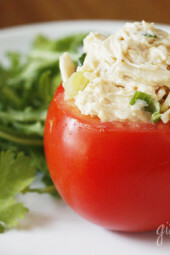 The flavors together just make for a delicious Chicken Salad! OMG YUM!!!!! I used a little less mayo and a little chicken broth ("cause you KNOW how I feel about mayo) and I gotta tell you with the addition of the cumin, garlic powder and chili powder I didn't even detect any mayo taste!! I also didnt have any scallion so I chopped celery into it which gave it a nice crunchy texture. The cilantro taste was the perfect little zing!! Haha ,oops, I just realized I completely forgot the lime juice but it tastes great all the same!! Can't wait for lunch tomorrow, gonna have this loaded onto celery stalks!!! Any recipe that requires tomatoes, I love making an egg white, scallion and tomato omelet. This recipe is the BOMB! I love it! Hubby made it for a quick dinner tonight and it is awesome! We had it on an Arnold select sandwich thin and a bowl of cream of asparagus soup on the side, delish!!! 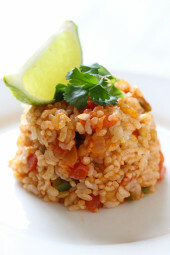 This was a great tasting lunch alternative, and quick and easy to make! Made this for dinner last night and am enjoying it for lunch as I type this. So yummy and super easy! Love this recipe too — I haven't tried one of yours that I don't like. I added a serrano pepper for some kick. Yes, I use boneless chicken breast. This is the easiest way to make perfect shredded chicken! 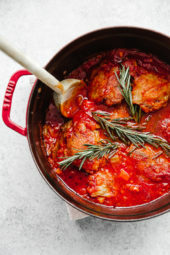 Chicken in the crock pot- if I just use boneless breasts will this work alright? I don't want to spend a lot of time picking things out 🙂 The broth is a bonus, what I really want is easy shredded chicken! Yummy! I made this for lunch as a sandwich. I boiled some chicken in chicken broth, and added whatever vegis i had on hand. In my case, red onions, tomatoes, celery and bell pepper(and of course used the cilantro,lime, and seasonings per your recipe). It was delish! Thanks Hannah! If you only knew how little time I had to shoot this, lol! It was like 6:30 am right before driving my daughter to school and heading off to the train to go to work! Gina, just wanted to give you props on this photo, it is my favorite one I think. Great composition and detail (you can see drips on the tomato)…. amazing! You talented lady! I've made this twice already! Super recipe!! This sounds really good, I will have to try it! I just made this for my lunch, and I even served it to myself in the hollowed out tomato. It's so much fun to eat something so good and so pretty! Thank you Gina for the great site. I love your recipes! this looks great! Love the tomato presentation! @Colleen, never heard of it but it sounds good! Have you ever tried Chicken Larb? It is an Asian chicken salad made with sliced onions,scallions, lime juice , fish sauce ,& sugar (I use Stevia instead)and chicken. It is very yummy, low carb(when you use the stevia) & low fat. Fabulous!! I am not a huge cilantro fan but I loved this recipe! Yum! Add 1 container of strawberry yogart and is is good too. 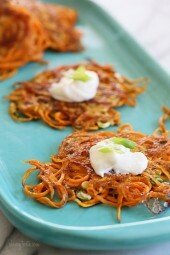 Great idea using sour cream! I just went to make this and realized I had run out of mayonnaise! I forgot that I had thrown the jar away a couple of days ago.. so I used light sour cream instead. It was so good! I also used chipotle powder instead of chile powder, gave it a nice kick. On top of an Oroweat roll. YUM! Thanks Gina! I made this last night and it was very good. I used it in a sandwich last night and did the hollowed out tomato for lunch. Thanks again for another great recipe! I'm going to try this one for sure. Looks great! Would even be great in hollowed cucumber boats! I stuffed yellow peppers instead of the tomato and it turned out quite well. Please don't ever quit this website because it has been such a lifesaver for me, and I love your ideas! Hey Gina, I've been SCOURING the internet for a healthier chicken salad recipe – this was wonderful! Just ate it after my work out and am totally satisfied. Thank you! This looks amazing and I cant wait to try it! Thanks! Just found your blog today and LOVE it!! Everything looks so good. I am excited to try so many of these recipes! I'll be back often! That looks yummy! I can't wait to make this. Cilantro and chicken pair so well! I love it too! You can use more in here if you want! This looks like such a great chicken salad recipe…I looove cilantro! I cut the top off then used a small sharp knife to cut around. Then I carefully scooped out the flesh with a spoon. I reserved the rest of the tomato to use later for cooking. I LOVE cilantro and can't wait to try this recipe! Thanks!! This looks wonderful. I think my kids would even enjoy sharing this with me for lunch. Any hints on the best way to hollow out a tomato(what kind, the right tools, etc.)? I'm afraid I would butcher it without some help. I can't wait to make this! Yum! You are my hero, Gina! I have been doing WW for a while now, and your recipes are such a treat. My husband is a fan too, which is a big bonus.